Anait is the oldest surviving religious site on Skye. It has been used by Druids, Celtic Christians, and Roman Christians. Informed estimates put its age as about 3,500 years old. 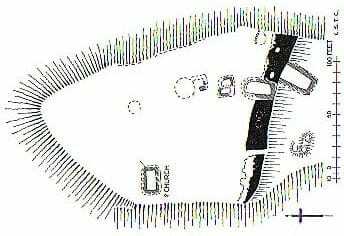 On the small island on which it stands, it is still possible to see the shapes of the original, small, Celtic chapel, dedicated to Saint Maolrubha, after whom the adjacent headland is named. It is also possible to make out the shapes of some of the individual monks' cells. These would have been used by followers of Maolrubha while attempting to convert the local population. The name Anait appears, in a variety of spellings, across Scotland. Its original meaning is a holy well or spring, usually associated with healing properties. It was the usual practice of early Celtic Christians to simply take over pagan sites, and continue to use them. Thanks to local resident David McClymont.